What does a Hollywood star, Jackie Coogan, have to do with a place called Broadway in the jungles of Burma during World War II? 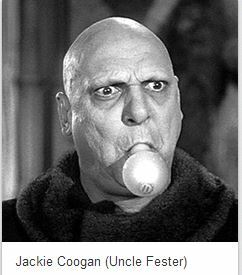 Those of you who are old enough will remember Jackie Coogan as the character Uncle Fester in the 1960s sitcom The Addams Family. Those of you even older will remember Jackie as a Hollywood child star who played with Charlie Chaplin in the movie Sidekick. Few of you will remember Jackie as a pilot who flew gliders in the CBI Theater of World War II. John Leslie Coogan was born in 1914 in Los Angeles, California and was the first major Hollywood child star. He began performing as an infant in both Vaudeville and film and continued his illustrious career until the 1970s. 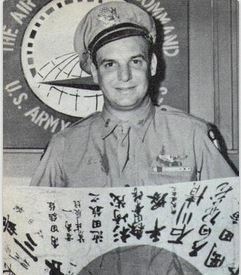 Jackie enlisted in the U.S. Army in March 1941. Because of his experience as a civilian pilot, he requested a transfer to the Army Air Force after the Japanese attack on Pearl Harbor on December 7, 1941. He was made a flight officer after graduating from glider school and volunteered for hazardous duty with the 1st Air Commando Group. His unit was sent to India in the CBI Theater in December 1943 where he was to participate in a very dangerous mission. During World War II, a specially trained group of commandos known as Chindits were ordered to infiltrate behind Japanese lines in Burma. They were to be flown into Burma aboard gliders and land at a site named Broadway, 150 miles behind Japanese lines. The operation became known as Operation Broadway and Jackie Coogan was one of the glider pilots. Operation Broadway took place on the night of March 5, 1944 and was by no means an easy mission. C47 Dakota transport planes, each towing two gliders, took off into the night. A total of 67 gliders were lifted from airfields in India and began their journey into Burma. Soon after the operation began some C47s began reporting the loss of their towed gliders. For one reason or another, the tow lines had snapped and around 18 gliders crashed before reaching Broadway. Some of the soldiers from the crashed gliders were killed, others were captured, and the remainder harassed the Japanese and escaped. The remaining gliders carrying more than 500 men and 33 tons of equipment arrived at Broadway where they began to land in the darkness. Almost all the gliders were damaged or destroyed as they hit obstacles or crashed into each other. The glider pilots were mystified because their landing speed was a third faster than normal. It wasn’t until the next day that they learned the commandos had overloaded the aircraft by bringing along unauthorized supplies. In the end, glider pilot Jackie Coogan and the other men of Operation Broadway were successful in establishing a foothold behind enemy lines. They were a thorn in the enemy’s side and harassed the Japanese for months, so the next time you watch a rerun of The Addams Family, remember Uncle Fester wasn’t just a pretty face. He was also a certified war hero. If you would like to learn more about how the troops at Broadway were supplied, you can find the answers in my book “Kicker” available at the sites listed below.